MTS plans to use 17 of the articulated buses currently in production for its new South Bay bus rapid transit (BRT) service expected to open later this year. The San Diego Metropolitan System (MTS) awarded New Flyer with a new contract for up to 50 Xcelsior® compressed natural gas (CNG) 60-foot, heavy-duty transit buses. MTS currently has 220 40-foot CNG New Flyer buses and 70 60-foot CNG articulated New Flyer buses in operation. The 50 New Flyer buses will replace existing buses in the fleet over the next five years. MTS plans to use 17 of the articulated buses currently in production for its new South Bay bus rapid transit (BRT) service expected to open later this year. South Bay Rapid is a new $128 million project that includes 12 stations along a 26-mile route from the U.S. – Mexico border to Downtown San Diego via eastern Chula Vista, connecting to employment and activity centers in Downtown San Diego and South County. The contract includes 30 firm orders (60 equivalent units) with options to purchase an additional 20 CNG 60-foot, heavy-duty transit buses (40 equivalent units). 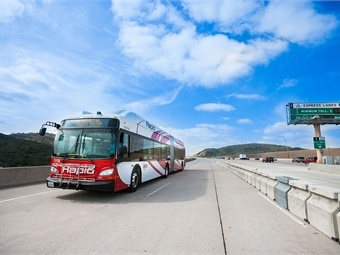 The order will support MTS’ state-of-good-repair efforts, commitment to clean fuels for its bus fleet, and its growing BRT system called Rapid.